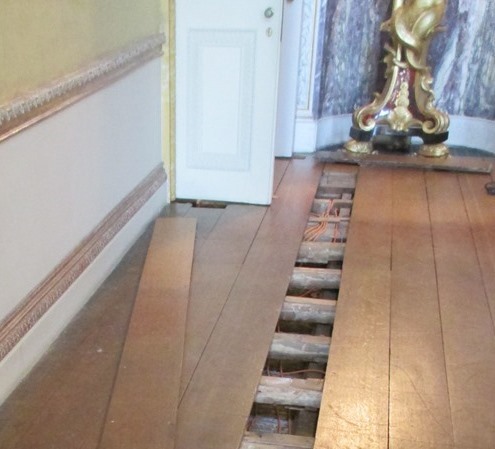 Once again I headed for Kingston Lacy with a mission to check under the floorboards in the house. 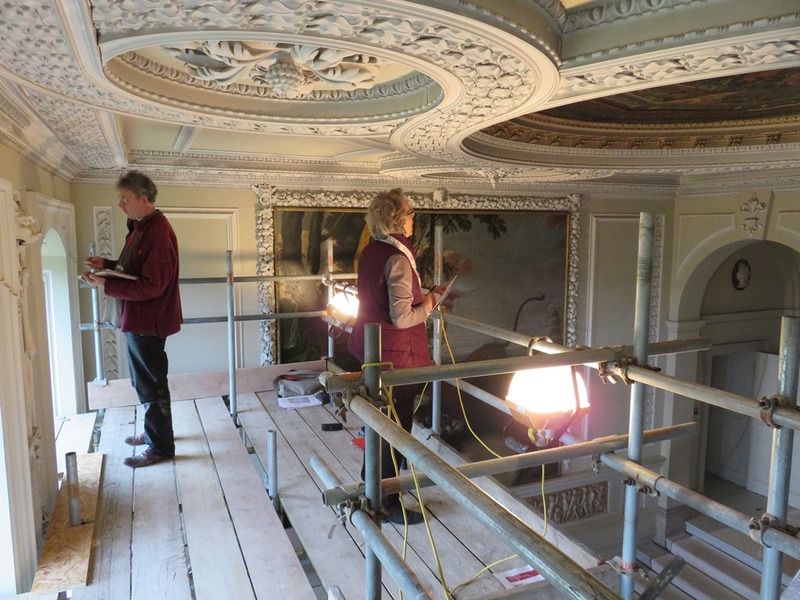 A condition survey was being carried out by Clivedon Conservation on the plaster ceiling above the marble staircase. 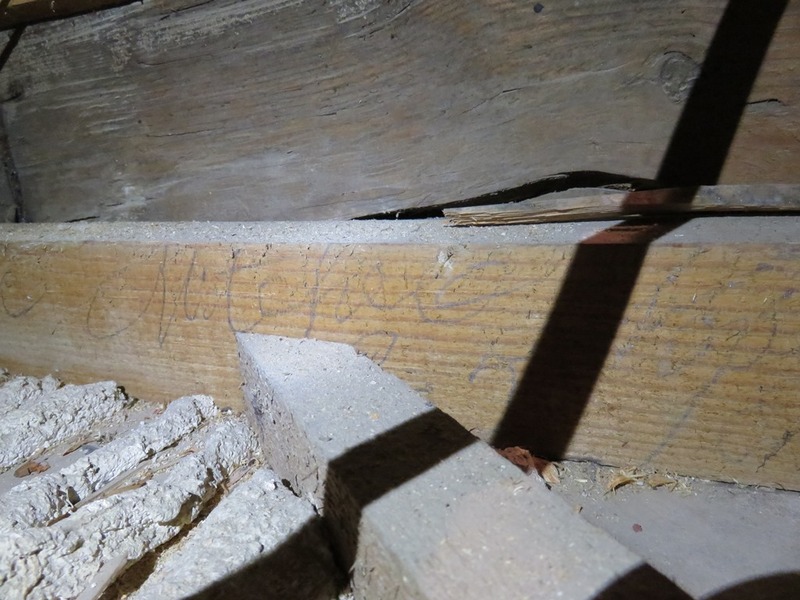 It was while looking under the floor in the third Tented Room above the ceiling that Douglas from Clivedon Conservation spotted some writing on one of the joists of the superstructure, but he had not had time follow it up further. 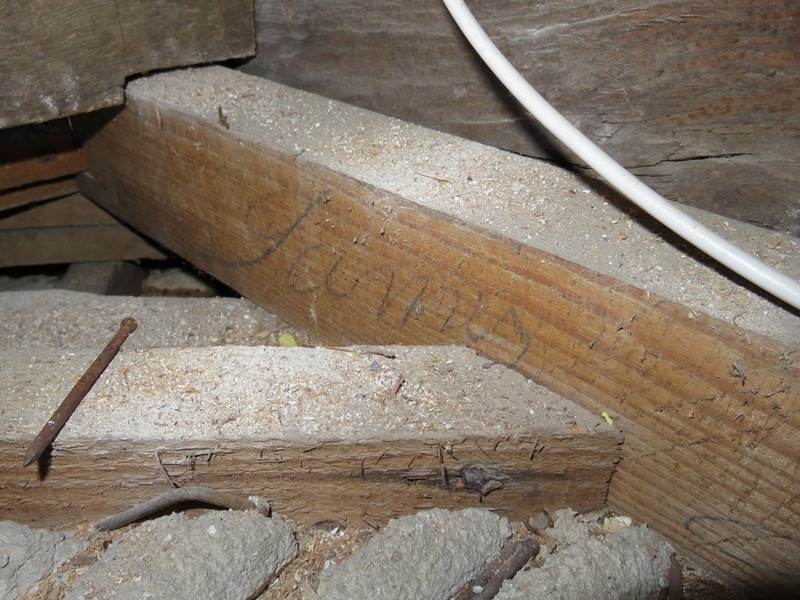 So as well as looking between the joists for objects lost down the cracks between the boards or hidden on purpose, I had a look at the faces of the joists to see if I could find more writing. It was difficult to get the right lighting and angle to make out the words, especially as not all the boards had been lifted. But with the help of torches and various settings on my camera I could make out one full name, a part name and a date! 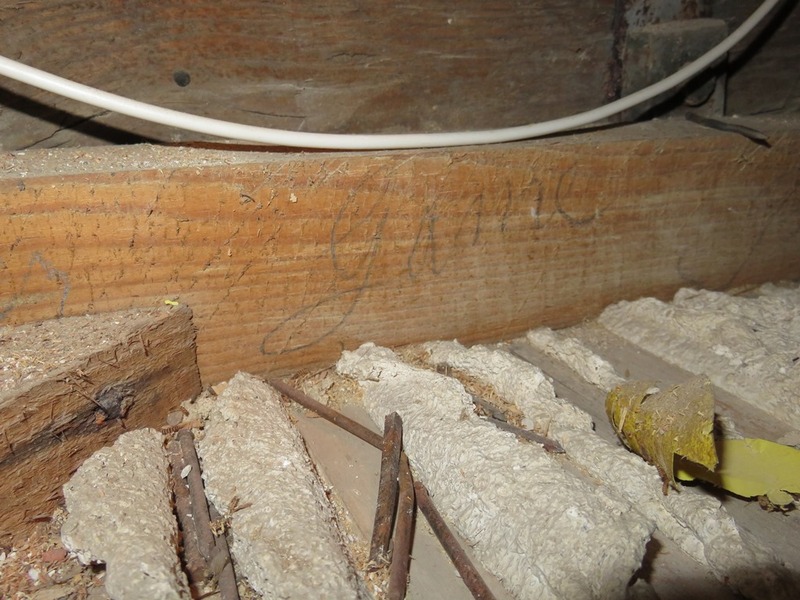 The complete name was James Game, followed by the name Isaac and something illegible, presumably a surname, and then the date November 25th 1837. William John Bankes commissioned Charles Barry in 1835 to remodel Kingston Hall. This work was completed circa 1841, so the 1837 date fits with work being carried out in the house. With access to the 1840 census I thought I would look up James Game to see if I could find him in the area or on the estate. It was exciting to find someone of this name living at Hillbutts, a small group of dwellings beside the boundary of the parkland around Kingston Lacy house. But best of all, his occupation was listed as a joiner! I think the second name of Isaac starts with an N? All ideas and suggestions welcome, then we’ll see if we can find Isaac on the census as well! 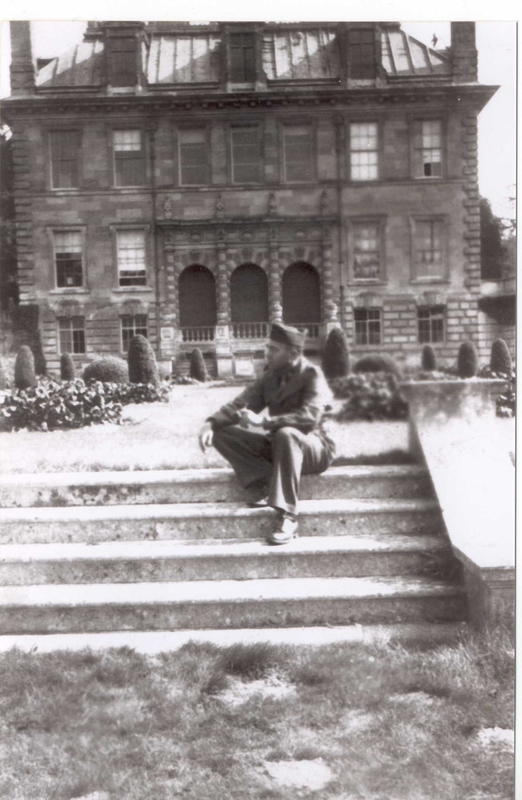 Grace, one of his daughters, has recently sent another of her Dad’s letters written while based at the American Army hospital during WWII at Kingston Lacy. We got very excited as it was about a visit inside the big mansion. It is wonderful to get first hand accounts of our properties in the past. 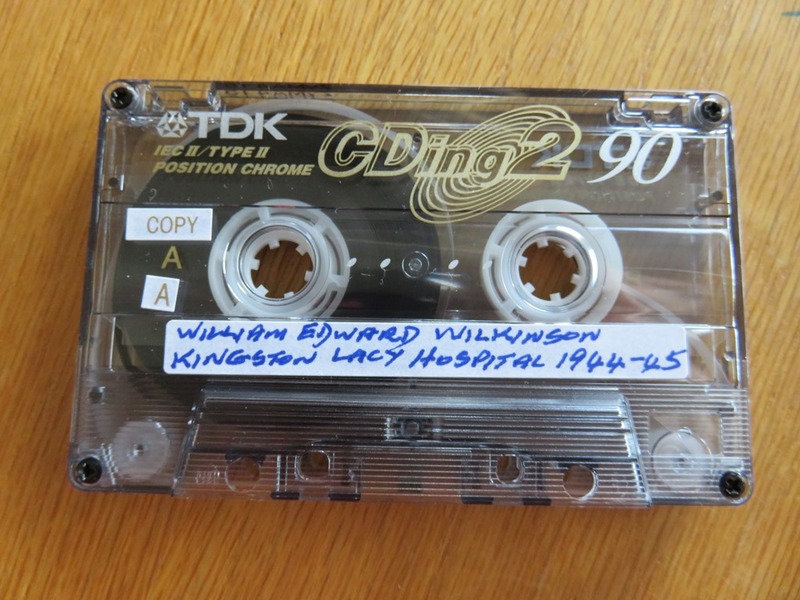 A fresh eye on the contents and place and we often glean important or interesting information we would never have discovered in the estate archives. 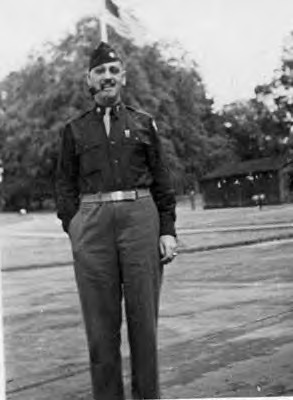 We had gathered from other family members of staff who served at the American hospital that they were allowed up to the house and that the officers had use of some rooms in the house. But we had no real details to confirm the past memories and snippets. I have reproduced the letter below as it speaks for itself…. ………………I must tell you! I had the most amazing experience today. Ten of us were invited to go thru Kingston-Lacy estate, the manor house. The agent’s kindness was great and he took us thru himself. As you enter the large entrance hall – all the beautiful marble with fluted columns – the pieces that take the eye are four enormous deeply and intricately carved teakwood chests about four feet high and eight feet long. They are massively exquisite! Swords, pikes, daggers, shields and armor adorn the walls in profusion. The carving on the chests is Jacobean (?). There are two daintily fine French cabinets. Enormous vases stand here and there. Two steps straight ahead take you to a right angle hallway which leads to marble stairs to the left. Here is a Van Dyke painting of a cavalier – another point of interest is a chair attached to a marble cabinet in which is a balance with bronze weights marked in measurement of stone (7 lbs). You sit in the leather chair and weigh yourself. It is 17th century. As you walk up the marble stairway toward a one piece window which much be 6 x 10 feet you are struck by the enormous bronze figures lying on the stairwell ledgers looking down. They are the works of Michael Angelo! The stair makes one (180 degrees) turning and on the walls are two enormous paintings of dogs attacking a bull. They were painted for one of the Kings of France! They were a gift to the owner years ago – or the master as they speak of him. Now we go into the library. The room is enormous and above the book lined walls are life sized paintings of the ancestors running back to 1700! Some of the books, most of them in fact, are old enormous works of art, some printed by hand! Desks, chairs, footstools are all most interesting, all very old and in excellent shape. I could have spent months there with pleasure. Adjoining is the saloon. I can’t begin to tell you of half the marvels here. Enamel portraits of many people of the times – most, most beautiful China figurines and some unbelievably delicate. Lace over the hair, around the collars and sleeves which I felt sure must be lace until I looked at it with a magnifying glass. 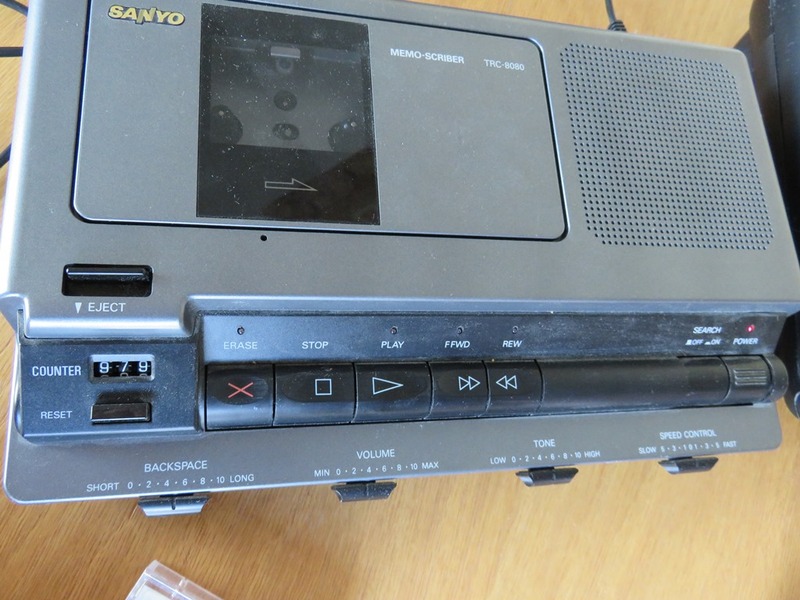 There were some pieces exactly similar to what you have on the way. Two Van Dykes were here. Now into the drawing room. Twice as big – really an enormous room. (All the ceilings are beautifully painted with figures) the overhanging border near the ceiling looks as though the room as been prepared for indirect lighting. Gold leaf adorns it! Here is an enormous painting by Sir Joshua Reynolds and another by Rembrandt! Many others whose names are not familiar to me, several Dutch names. An ebony and ivory cabinet heavily inlaid with mother of pearl! It is most delicate. A book of signatures bears many King’s names, the Duke of Windsor’s, German Emperor, or Duke of Wellington, etc. etc. I can’t remember everything – museum pieces were in the greatest profusion. 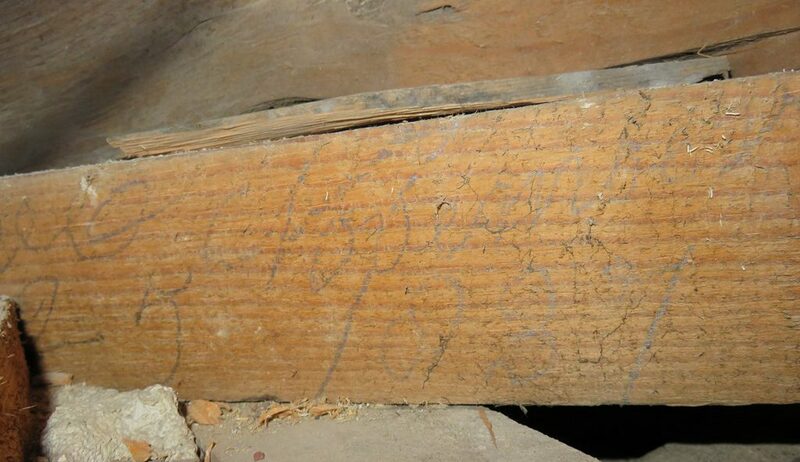 Every door everywhere was carved deeply and signed by – Gobelin (?) I’m not sure of the name but he should be famous. Now into the small or private dining room. The walls are oak covered with the original leather all over. It is dark and cracked. The ceiling is most beautifully carved and covered with gold leaf! Here Gen. Montgomery stayed and ate before the invasion for two weeks with his staff! This room has many pieces about the room from Spain. It is called the Spanish Room. Now the State dining room. It must be 40 feet square. An enormous massive circular mahogany table in the center would seat a regiment. 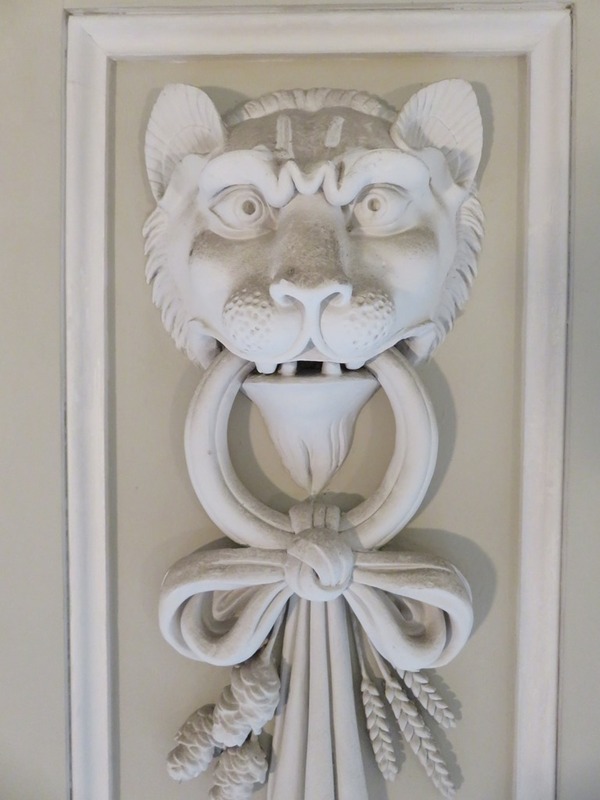 The walls are oak paneled and the doors are two inches thick plus the carvings which are 3 or more inches bas-relief. Tapestries long on each wall and the most colorful and beautiful I ever saw. From here we went upstairs again to the bedrooms. About 10 of these have little dressing or sitting rooms adjoining & also a bathroom – but there are no fixtures or tub or anything. The bath was made ready by the servants. All beds are four posters (10 feet). Prints and bric-a-brac of all periods adorn everywhere. Now upstairs again to the nursery and servants quarters. The corner bedrooms are adorned to make them appear as tents. Cords (wood carved) run down the seams from the top from head height they taper to a point. At the head of these top stairs is a low gate (carved, of course) to prevent the youngsters falling downstairs – the servants’ quarters are as nice as ours at home. From here we went onto the roof. The roof is solid sheet lead! The chimneys (4) are enormous and each has 8 big lead rectangular outlets, all of lead. The agent said each weighed 300 lbs. Now to catch up a few points – a picture in the drawing room – glass encased is worth 1/4 million ($1,000,000). I didn’t hear the name of the author or painter it is Madonna with two children. The chandeliers (4) deserve a word. Cut glass, very intricate and enormous. Each was alike in drawing room, salon and two dining rooms. They must be 8 ft high and four across. They held I guess 100 candles. How they sparkled. Now down to the 1st basement where is the room which we would call the den where the gentlemen retired after dinner for their smoking. Paneled walls of Belgian oak, racy and racing prints and prints of beautiful horses, many hunting scenes and such – a wheeled server for liquor and wines and such was beautiful with recessed and carved receptacles for glasses and decanters, all filled with proper glasses. Then across the low ceilinged wide hall to the billiard room with a full sized (not our size) table similarly decorated. The present master has a bed here where he sleeps when he comes here. His sister sleeps in the smoking room. Now to the kitchen. The original tables and benches and ovens are here! It is enormous, the tops of the tables are 2 inches thick and sturdy as stone. The floor is flagged with large stones. The ovens are built in the wall (new electric stoves stand beside them). The two obelisks I spoke of previously were brought from Egypt and the cornerstone was laid by the Duke of Wellington, Napoleon’s nemesis. Some of the doors took 3 years – for their carving – and they look it. A total of 56,000 acres append the estate. They are taxed all but 6 pence out of each pound of revenue – the gov’t gets $3.90 out of $4.00! I don’t want to bore you but I wanted to tell you about this. It is all so very interesting to me & I wish you could see it. You would love it. I’d never get you away. Here I have done all this writing and no work done so I will have to get busy, my love. If you don’t mind, Mother would probably enjoy reading about these things. I am getting writer’s cramp & can’t make my pen behave – I have been hurrying to get to my work. How about sending me a couple of pairs of cheap cotton gloves to protect my hands from this coke & coal I have to handle? Did you say you had sent me some nuts? West is going to London next week and will take my film to be developed, then I’ll send it to you. I love you my dearest, but I wonder if you have read this far. Goodnight and kiss my girls for me – I kiss you in spirit my love – and in person. Again someday I hope – soon. Thank you once again Grace and family for treating us to such a wonderful insight in to life during the war on an English country estate. 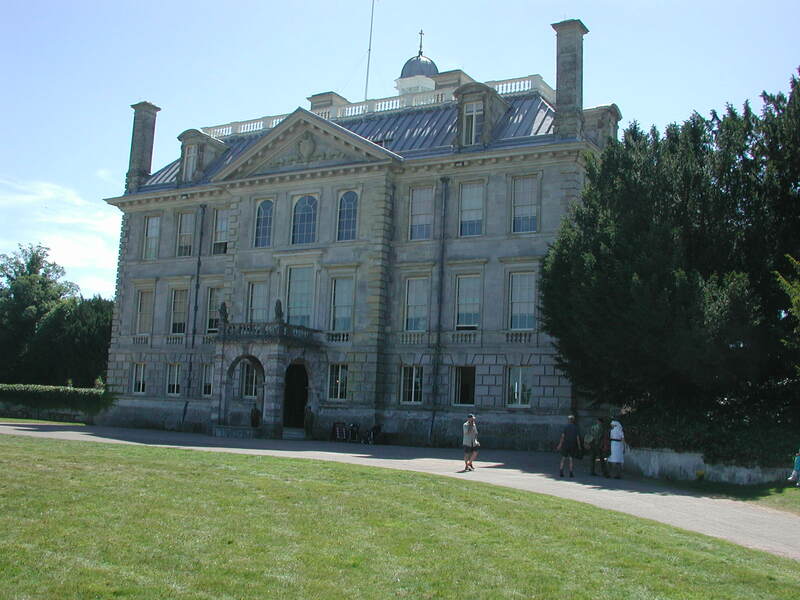 The north side of Kingston Lacy House. Designed by Roger Pratt for Ralph Bankes in the 1660s. Revamped for Henry Bankes by Brettingham in the late 18th century and then done over again by Charles Barry for William John Bankes in the early 19th century. We often get called in to check everyday repair work inside our great mansions, electric cabling, loose flagstones or finding where water is getting into the building. 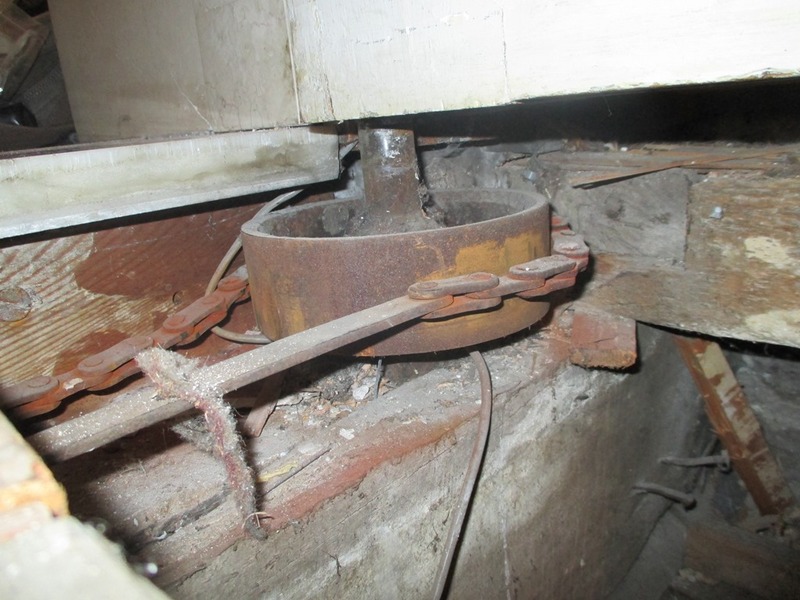 This kind of watching brief (monitor and record) gives us a chance to look beneath floorboards and behind paneling, it provides an opportunity to see how the buildings were put together and more importantly any changes done through time. At Kingston Lacy wiring and ceiling checks are being done in some of the rooms with just a few floorboards being lifted. Having found scraps of original wallpapers and notes left by previous workmen during work like this in the past we were called in to record anything we could see. 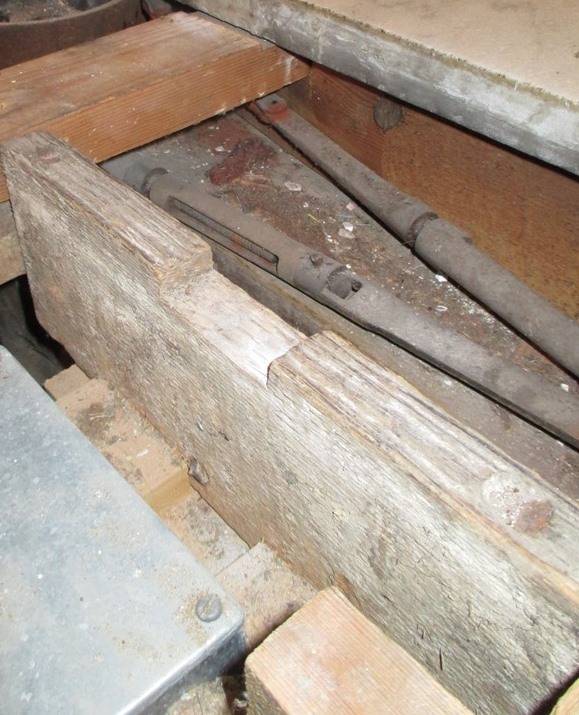 In the saloon we found that a lot of the material between the joists had been removed in the past with just a few wood shavings and the odd nail left behind. The most interesting areas were accessible via the doorway, with just enough room to dangle my camera into the void and between the joists. I set it to do 10 shots on the self timer setting and hoped for the best. 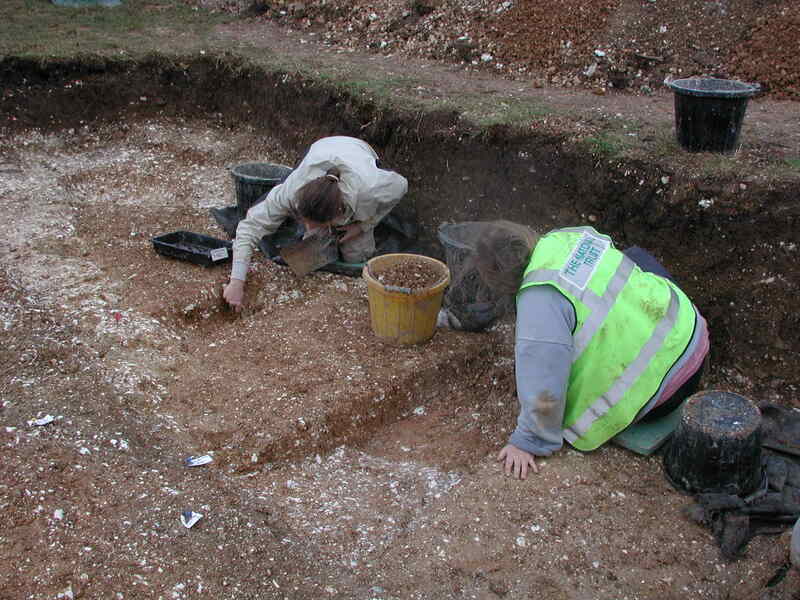 This technique is a good way to see down and along voids, it had produced good results in the past at Chedworth roman villa when checking for hypocausts and wall alignments. We were not disappointed an odd metal concertina like heating system, a large vaulted void, Pratt bricks from the original mansion, (now encased in stone) and an intriguing door mechanism. The Saloon is entered and connected to other rooms by double doors, the lifting of the floor boards revealed how they opened exactly together, even when just pushing gently on only one door. This would help servants when carrying trays open the doors without putting the tray down or needing someone to help them, also when entering or exiting the room with swishing skirts ladies could move effortlessly through the doorways. It works by using what look like bicycle chains and smooth cogs, a simple but effective mechanism. 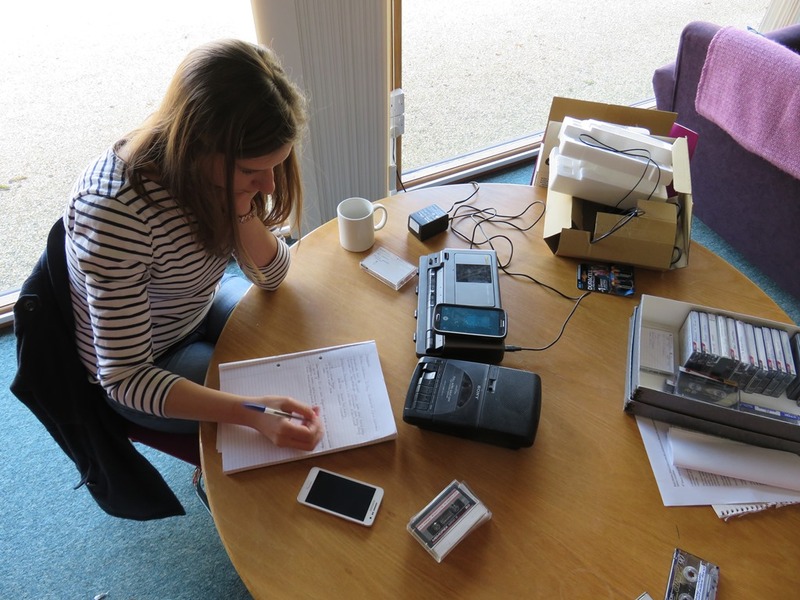 There are more planned surveys to be done at Kingston Lacy in other rooms, I wonder what awaits to be found under the next floorboard…………. 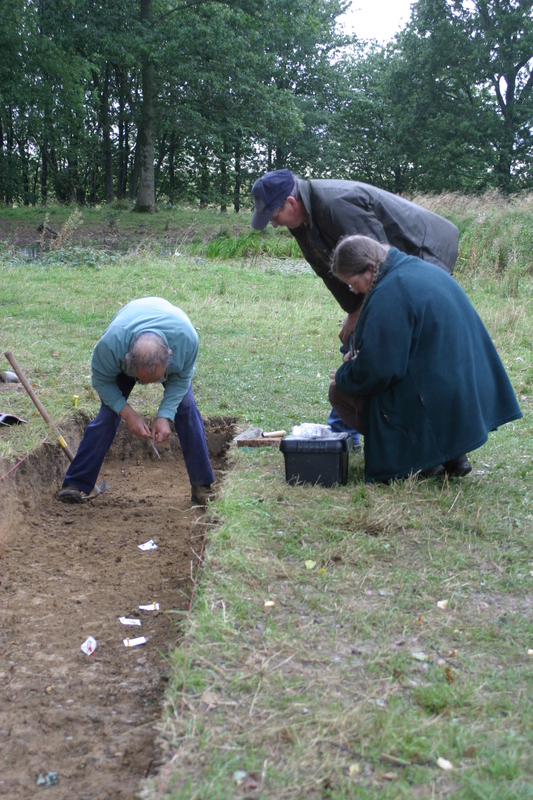 Buildings archaeology tends to be less straightforward than dirt archaeology. 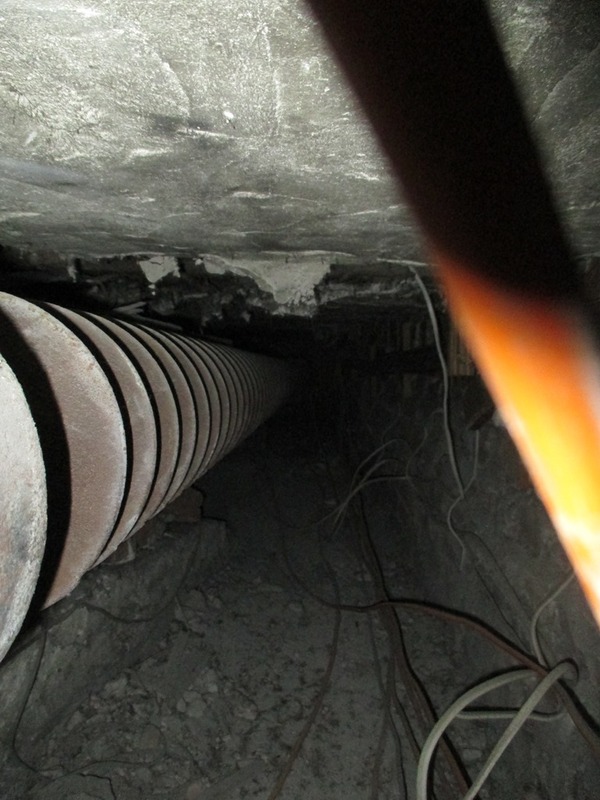 Standing structures in 3D are not sealed beneath the ground. You have to work out whether the thing you are uncovering is an original piece of the building, in its right place, or part of an older building moved and recycled from somewhere else. Fireplaces are good evidence. Usually the massive inglenook fireplace has been infilled by a nest of smaller and smaller fireplaces as fashions, usage and the technology of heating changed. These days it’s all the rage to open up and expose the original large fireplace again and this unseals evidence of the everyday lives of the families who lived there centuries before. The centre of a building is the hearth. It’s where the warmth is. Where the meals are cooked. 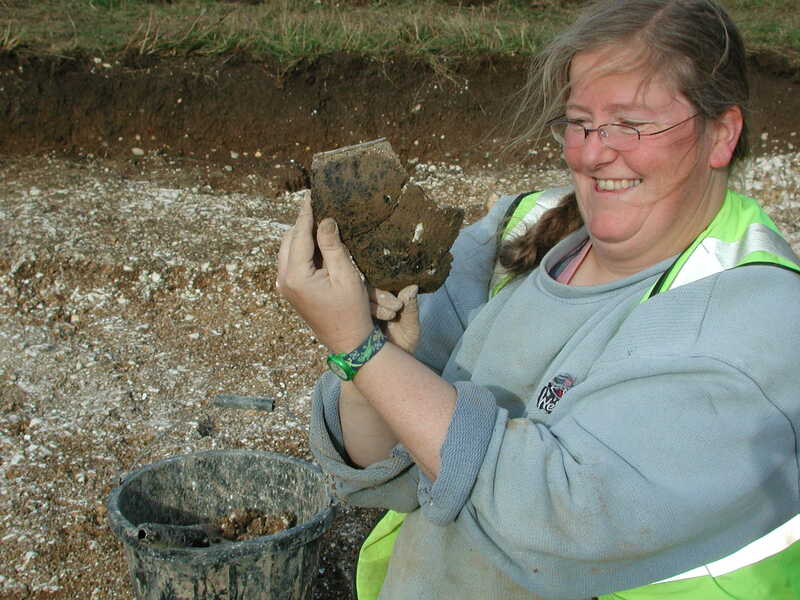 The 4500 year old Neolithic houses recently found at Durrington on the Stonehenge Estate had hearths at their centres. The ordinary medieval cottages at Kingston Lacy would have had open hearths with the smoke seeping out through the thatch, but by the 16th century some would have had two closely set roof trusses to catch the smoke and direct it out through a vent ( a smoke bay). By the early 17th century, when brick was becoming more common in Dorset, cottages were getting fireplaces. People worked out various ways to use the heat from the fire to get various jobs done. When an inglenook is opened up there is usually more than a fireplace. There may be hooks to hang meat or other things on… A small alcove perhaps for keeping salt dry, perhaps the remains of a mechanism for turning a spit and very often a bread oven and if you’re lucky its iron door, complete with catch still in place. I had tea with an old couple in their cottage at Corfe Castle about 25 years ago. They still had their bread oven and told me how their parents burnt the gorse on Corfe Common to make ‘blackstock’ this was harvested by the tenants of the Corfe Castle Estate to burn in the bread ovens. When the oven was hot enough the ash was raked out and the bread could be baked. Last week I went to 545 Abbot Street on the Kingston Lacy Estate. This was one of the last cottages on the Estate to be repaired up to modern standards. 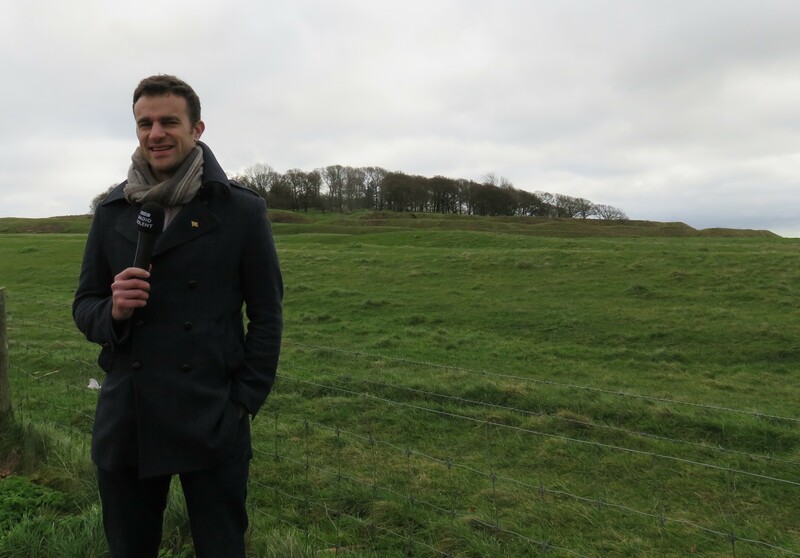 It has been a long process to find the money to repair all the hundreds of cottages across the Bankes Estates. 545 Abbot Street before work started. The brick infill was probably originally wattle and daub traces of this survive inside. It is an early 17th century timber framed building, originally infilled with wattle and daub but this was largely replaced with bricks in the 18th and 19th centuries. In the centre of the building is a large brick structure containing a massive infilled fireplace. When I first went there in 2014 there was a 20th century range built into the blocking. The infilled inglenook fireplace at 545 with the range inserted. When I revisited, the original fireplace had been exposed. Not one but two brick bread ovens side by side but on the left another opening with a circular void continuing up to the first floor. 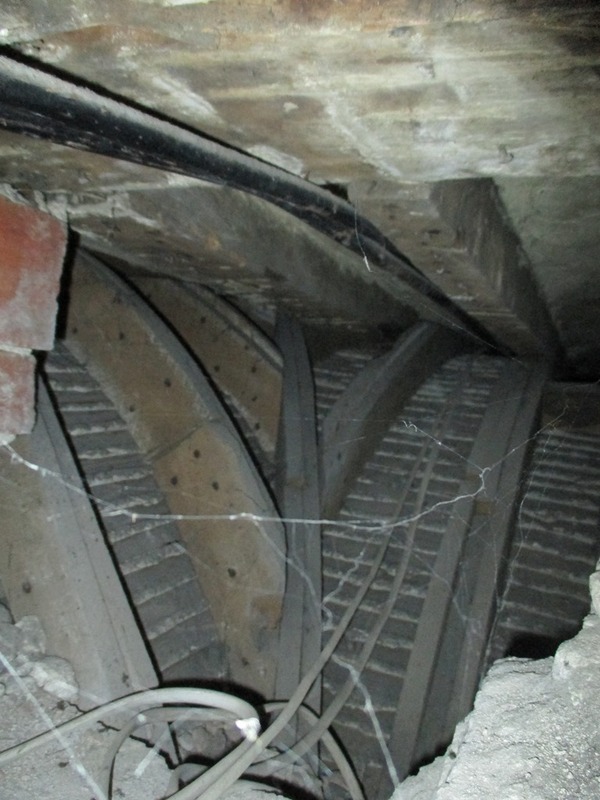 At this level, the blocked entrance to the chamber could be seen cutting through the original wattle and daub screen infilling the roof truss there. I’d only seen one other of these features at Kingston Lacy: a cottage at Tadden where the void turned out to by a curing chamber. This was a good way to preserve bacon by smoking it next to the fire. The meat was cut up into joints and hung on a rack from the first floor placed on a tray which would allow the smoke to circulate evenly. There are recipes for the smoke, burning ash or oak was usually favoured and perhaps a few juniper berries mixed with sawdust to improve the flavour. The surviving wattle and daub infill on the first floor of 545 above the inglenook. Cut into the collar are two inserted posts for a door into the curing chamber which was later blocked. But was it a curing chamber? It might have been for drying corn either for milling into flour or for seed corn for the next crop. 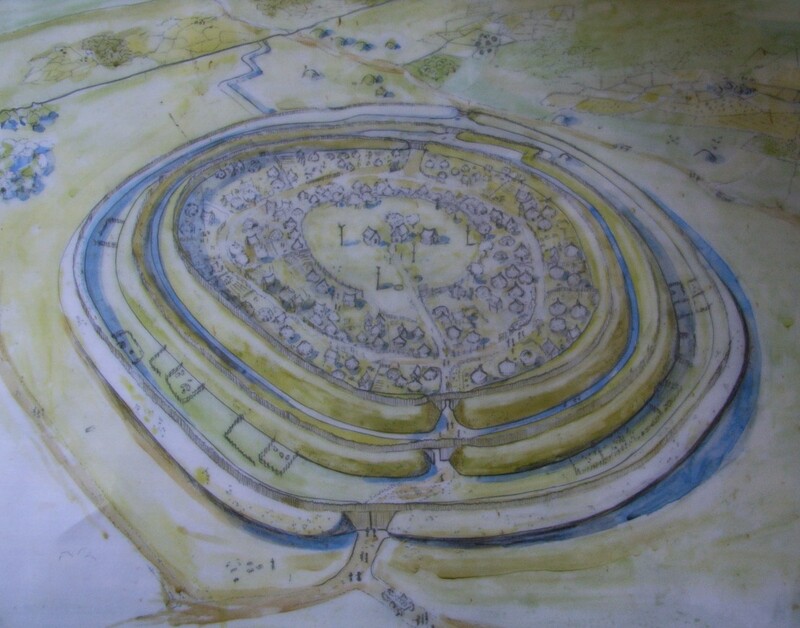 Another possibility is that it was used as a kiln for drying barley as part of the malting process to create beer. 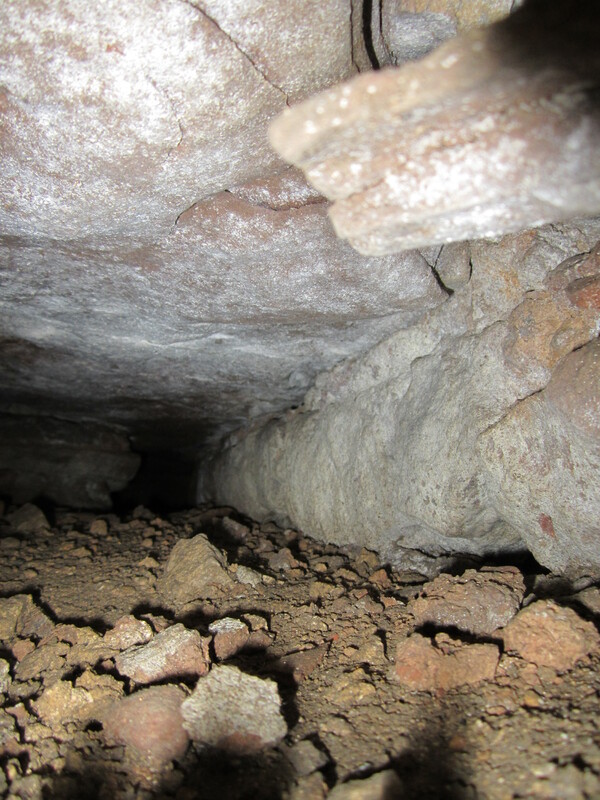 All these processes have been found in fireplaces across the West Country. Tony is making the archaeological record as the building is repaired and he will hopefully find the evidence that will give us the answer. So the family living here in the 17th and 18th centuries were small-scale farmers and these tenants would have grown cereals in the open fields and kept livestock in the paddocks around the cottage. It is described as ‘house garden yards and orchard’ on the estate map of 1774 but at that time the land belonged to Sir William Hanham. The Bankes family bought it a few years later. The small farms were uneconomic and during the 18th-19th centuries they were absorbed into larger farms and the multipurpose fireplaces gradually went out of use.. I hope the new National Trust tenants enjoy their new home. They probably won’t be smoking bacon though.